The Zhang Lab applies inorganic and organic synthetic and physical techniques to prepare and characterize new nanoporous materials such as MOFs and POPs, as well as novel organic fluorophores with interesting structural, chemical, and optoelectronic profiles. 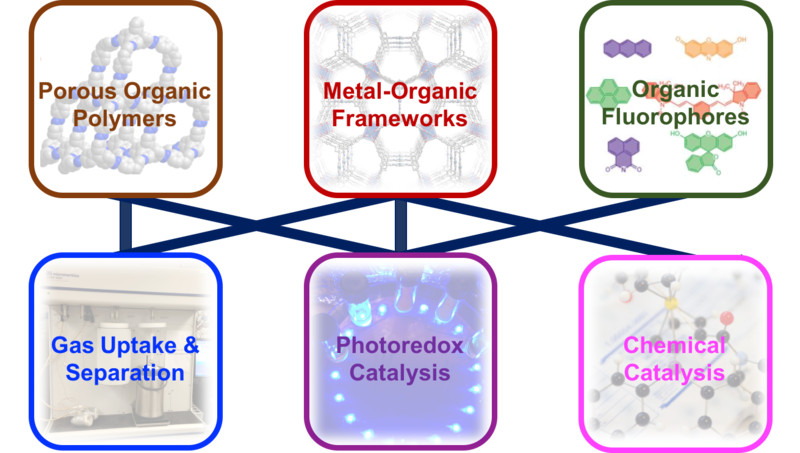 Current research goals are focused on the applications of these molecular materials in photoredox catalysis, chemical catalysis, as well as clean energy storage. Students in the Zhang lab make new molecules and materials using organic and inorganic synthesis, and study them using a wide range of techniques – NMR, mass spectrometry, IR/Raman spectroscopy, UV-vis/fluorescence spectroscopy, EPR, electron microscopy (SEM), thermal analysis, X-ray crystallography, X-ray powder diffraction, gas adsorption, calorimetry, electrochemistry (cyclic voltammetry), etc. Students will learn to take multiple approaches to ask and answer scientific questions.